Keshi Agrees to Pay Assistant from His Pocket after he was laid Off By NFF. 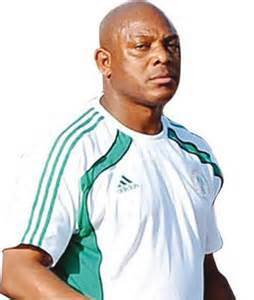 The recent backroom shake- up by the Nigeria Football Federation (NFF) had Stephen Keshi’s assistant Valere Houandinou’s name scraped off the payroll of the broke federation. His employer, ‘big boss’ has opted to now pay the Togolese from his own pocket. “Keshi has decided to shoulder the burden of paying Valere’s salary after the NFF said it was running low on funds to carry the huge wage bill of the Super Eagles,” Keshi’s brother and manager Emmanuel Keshi confirmed to MTNFootball.com. “The decision by the ‘big boss’ is to support the NFF through this difficult times because NFF president Aminu Maigari is a good man who has been very sincere and supportive in ensuring that the Eagles succeed. “As part of the efforts towards moving forward, Keshi has resolved to use his goodwill for the NFF, remember President Goodluck Jonathan gave him a blank cheque upon his return from South Africa, Keshi intends to cash that cheque now by appealing to the President to support the NFF. Valere, who also worked with Keshi to qualify Togo to the 2006 World Cup, was laid off by the NFF recently, after admitting they’ve ran out of fund. Rogers Cup: Murray Loses to Gulbis in Straight Sets. Next articleAkpala Called Up to Replace Injured Emenike. Nigeria Outpaced Korea Republic, Through to the Knock-Out Stage of Turkey 2013.